Few places are as romantic as Venice ( Venezia ). The city historically was an independent nation. Venice has been known as the "La Dominante", "Serenissima", "Queen of the Adriatic", "City of Water", "City of Bridges", and "The City of Light". It is often cited as one of the most beautiful cities in the world, and Venezia is really one of the most unbelivable cities you will ever see. The private palaces or the great hotels of Venice will be great for your wedding. 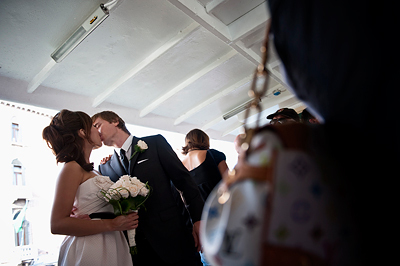 I am one of the best wedding photographer in Italy an I live between Milan and Venice. I will took you to the hidden place of Venice to shot pictures that will last for life time. So you booked your Wedding in Venice and you will not hire a professional? Vittore Buzzi is an awards winning editorial, commercial and wedding photographer. He shoots only 25 weddings every year. He shoots wedding with a photojournalistic style. Remeber that Venice is really one of the most beautiful cities in the world. Be sure that you are hirng a photograher that know very well Venice. I actually live in Milan but I spent 4 years in Venice and I still own a house there near San Marco square. I know the most beautiful and secret place of Venice to take faboulous picture of your wedding. Be sure the you are hiring the photographer that shoots the pctures that you are looking. My wedding photography style is unobtrusive and non-invasive: "fly-on-the-wall". You will know that I'm there, but you will hardly realise that you are being captured. This is reportage WEDDING PHOTOGRAPY as it happens. Venice is really a dream on earth, the meories of you wedding in Venice will last forever. Be sure to have with you a professional wedding photographer. I'm based in Venice and Milan. In Venice I'm 3 minutes walking from San Marco square near all most important Venice Hotels. Ask for a free estimate for your wedding in Venice.